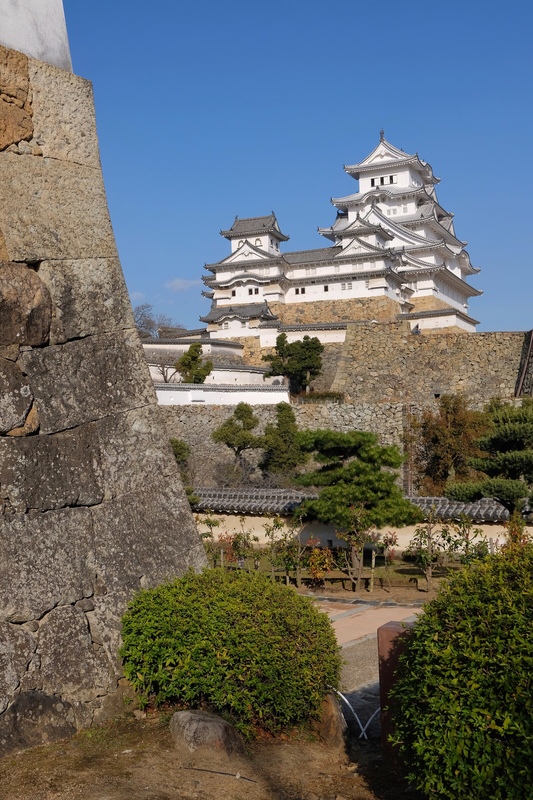 We took a commuter train to Himeji one morning, dropping off our bags at our hotel before walking 15 minutes up a main street to Himeji Castle, a centuries old wooden castle that’s painted white and rests on the landscape of the city like a jewel. Himeji Castle from the interior gardens. Nicknamed the White Heron, it sits on several km of land that used to be the keep for military forces in the area, the ruler and his family, and whole hosts of tradespeople, soldiers, business owners and labourers in the fields inside and outside its fortified walls. Today, the castle is incredibly impressive thanks to the sheer size of the beams and pillars that make up its intricate structure. Entire trees, several feet in diameter fill the ceiling at regular intervals, tying themselves into the even bigger pillars that descend from the top of the structure down to its basement levels. The scale of Himeji Castle is incredible. 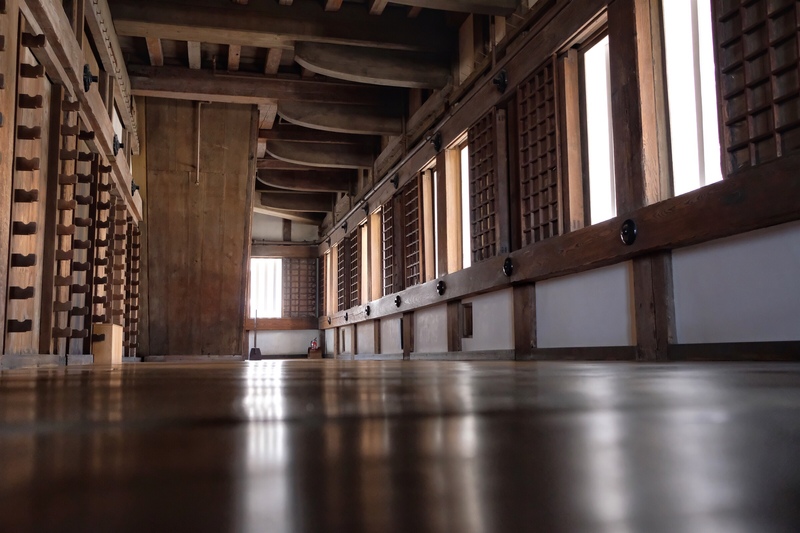 The inside of Himeji Castle. It took us all afternoon to do the place justice including touring its small gardens, public paths and some of its secondary buildings. The next day we took a local bus that wove its way through the suburbs north of the city to a cable car that took us up to Mount Shosha. There we walked through shaded forest paths to visit the main temple and monks’ training halls, which were filled with ancient statues and artifacts from the temple’s long history. It’s a peaceful spot, with birds chirping, no sounds from the city and views of the countryside and nearby hills that are incredible. 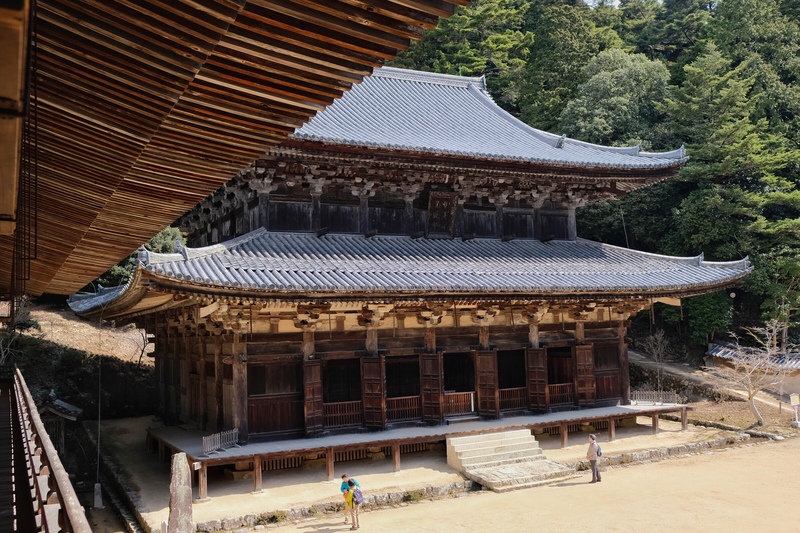 One of the main buildings on Mount Shosha – as seen in ‘The Last Samurai’. We stopped for lunch at a restaurant called Sakurasaku, where the owner prepared us each a vegan meal that was one of the most surprisingly fresh and simple we’ve yet had in Japan. It rivalled the vegetarian ramen we’d had the night before at Koba and More, a place with just six stools at the bar overlooking the kitchen. The owner was incredibly accommodating in making us veggie both from scratch and very charming, talking to us as we ate and telling us a little about his life and favourite places in Japan. Amazing vegetarian ramen from Koba and More. We only wish we’d had more time in Himeji so we could enjoy more of its beautiful sights and have more of its delicious food. Such a beautiful memory of the home made ramen, it looks absolutely delicious! That castle is beautiful too, I’d love to see pictures of the inside too. 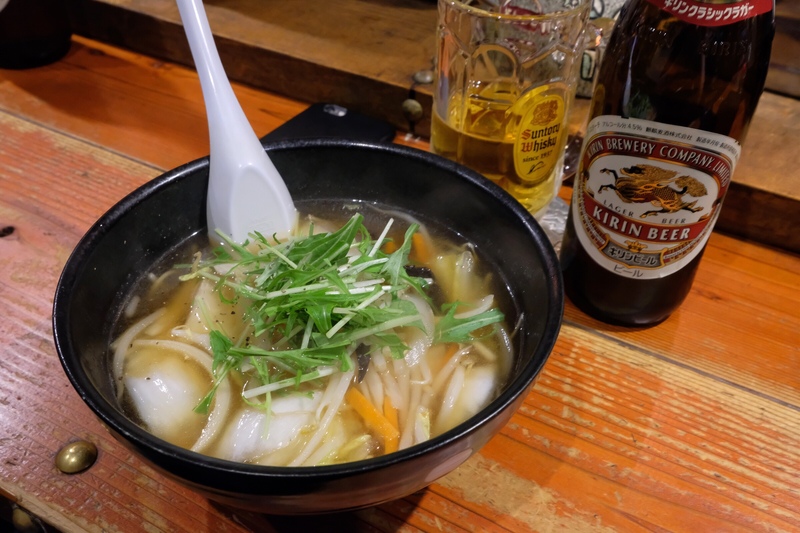 We had a few different versions of vegan ramen throughout the trip, but this one was a favourite simply because of the place, and the owner and chef. He only plays jazz music, which is lovely, and is always smiling and joking, talking and laughing with his guests. We felt really relaxed and at home, like we’d eaten there forever, even though it was our first and only time. Kind of reflects our whole travel experience in Japan.